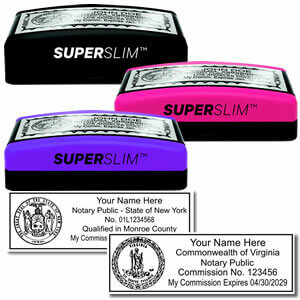 Super Slim pre-inked notary stamps are the newest addition to our slim and pre-inked family. These eye-catching Super Slim pre-inked notary stamps are available in a variety of colors with your choice of ink color. The Super Slim pre-inked notary stamps are even slimmer than our traditional Slim Notary stamps. These Super Slim notary stamps are perfect for a mobile notary as they will perfectly fit in a purse, briefcase or pocket with room to spare. Their bright colors allow them to be easily found in a bag or desk drawer and their rectangular design allows them to fit effortlessly within the margins of a heavily-worded document. Super Slim pre-inked notary stamps are eco-friendly and easy to maintain. The internal inkwell never needs replacing and can be re-inked time and time again. Super Slim pre-inked notary stamps are a great addition to your tool box - even if you already have a notary stamp or seal. You will love the sleek and professional look of these stamps and we know your client will too! May not meet state specifications if your state requires a round stamp or a stamp larger than 15/16" in height. Please do contact us or your state board if you are unsure if this stamp can be used in your state.